DEMOCRACY NOW!—From Pacifica, this is Democracy Now!. AMY GOODMAN: “Hillary Clinton first ran for the Democratic presidential nomination in 2008 but lost to President Obama. 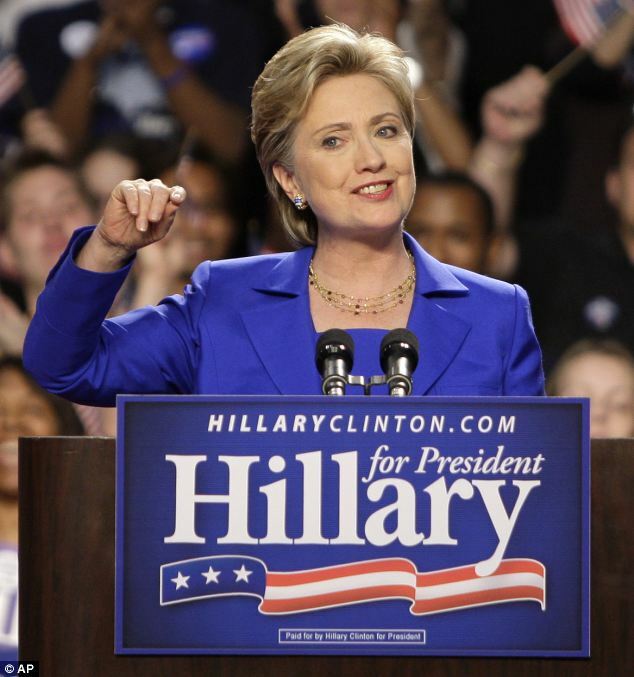 Long considered the Democratic front-runner, she has been expected to declare her candidacy for months. Democratic candidates who may join her in her bid include former Maryland Governor Martin O’Malley, former Rhode Island Governor and Senator Lincoln Chafee, and former Virginia Senator Jim Webb. This comes as Senator Marco Rubio is expected to announce his bid today for the Republican presidential nomination. Senator Rand Paul of Kentucky announced his plans to run last week, and Texas Senator Ted Cruz launched his candidacy in March. “Well, to discuss Clinton’s second bid for the White House, we host a roundtable discussion. “Here in New York, Joe Conason joins us, editor-in-chief of The National Memo, co-editor of The Investigative Fund and author of The Hunting of the President: The Ten-Year Campaign to Destroy Bill and Hillary Clinton. “In Los Angeles, we’re joined by Robert Scheer, longtime journalist, editor of TruthDig, author of many books. His latest is They Know Everything About You: How Data-Collecting Corporations and Snooping Government Agencies Are Destroying Democracy. Scheer is also the author of The Great American Stickup: How Reagan Republicans and Clinton Democrats Enriched Wall Street While Mugging Main Street and also Playing President: My Close Encounters with Nixon, Carter, Bush I, [Reagan], and Clinton and How They Did Not Prepare Me for George W. Bush. “And in Seattle, we’re joined by Kshama Sawant, a Socialist city councilmember. She helped win a $15-an-hour minimum wage for all workers in Seattle in one of her first moves when she became a member of the City Council. She’s a member of the Socialist Alternative, a nationwide organization of social and economic justice activists. She is up for re-election this year. JOE CONASON: “Well, I don’t support her. I’m neutral in the primary, as I was the last time, when she ran against Barack Obama. I didn’t endorse her then. In fact, I was probably tougher on her than I was on Obama. So the idea that I’m endorsing her for anything is not right. “But, I mean, I was interested yesterday to see her announce, because she is clearly striving for a different tone. Last time, I and others wrote about the kind of baroque kind of almost coronation that they seemed to expect in her campaign: She was inevitable; she had more money than Obama or anyone else, and therefore she was going to just cruise to the nomination. And, of course, that turned out to be completely wrong. They made many mistakes in that campaign. It was a campaign that was divided against itself, in many cases. And she lost narrowly, but she lost. And I think, looking back on that, this time she has attempted to roll out her candidacy this time in a very different way—a modest tone, a tone of “I want to be your champion,” a slightly populist tone that I think is appropriate to this moment. And we’ll see what happens from here. KSHAMA SAWANT: “Well, as Joe was saying, you know, she is now trying to use a veneer of a populist image. But look, this is a person who has hired 200 advisers to tell her how she can look populist without angering her wealthy donors. And ultimately the question is absolutely about her record as a warmongering secretary of state who used her position to emphasize the drone attacks, to be a vocal proponent of the 2003 invasion of Iraq, and to use her position to promote the interests of multinational corporations at the expense of the interests of working people. And ultimately, you know, this candidate, if she is backed by the Democratic Party establishment apparatus, is going to be the Wall Street candidate. And fundamentally, we have to ask ourselves the question: Is the Democratic Party establishment ever, despite the populist imagery or rhetoric they may use, going to be—ever going to be a genuine vehicle in any way to promote the interests of working families? MICHELLE GOLDBERG: “Well, I’m certainly going to support her versus whatever candidate the Republicans put up. You know, I’ve been pretty critical of Hillary Clinton over the years. I didn’t support her in 2008. In fact, I was furious with a lot of the older feminists who suggested that it was incumbent on women to vote for Hillary. “I was impressed with the rollout because, I mean, what’s interesting is that Hillary has been in public life for such a long time, and yet sometimes it can be hard to pin down exactly what she stands for, in part because she is a very changeable, chameleon-like candidate. You know, there was kind of Hillary the feminist lawyer, who worked on behalf of children’s rights. There’s the Hillary the senator, who sponsored a flag-burning amendment. You know, there’s now Hillary the grandmother, who’s talking about paid family leave and those sorts of things. My sense is, is that as many different kind of incarnations as she had, the one constant in her career, and maybe the place where she’s the most authentic, is in her concern for women and families, women and children—you know, the work that she did on maternal mortality when she was in the State Department, for example. And so, inasmuch as that’s going to be the center of this campaign and inasmuch as she is able to marry this kind of family-focused progressivism to women’s issues, like paid—or not women’s issues, family issues, but parental issues, like paid family leave, early childhood education, the sort of things that have never been at the center of a presidential election before, you know, not only do I think that that is a really good thing for feminism, but I also think that that is the best side of Hillary Clinton. ROBERT SCHEER: “Yeah, I think it’s absurd to suggest she’s a friend of children who are in need or families. This is a woman who, when her husband was governor, I first met her at that time, when I went down to interview him for the Los Angeles Times and he was starting his presidential run. And they were bragging about their welfare reform, which destroyed what existed of support for poor children in Arkansas. Then, as president, her husband, with her full-throated approval, destroyed the aid to families with dependent children, which 70 percent of the people on that program were children. It was the major federal program to help poor people and poor families, and in the cynicism of the Clinton administration, they destroyed that program. And we have no—we don’t even have an accounting of poor children anymore. They’re off the radar. So, that’s just utter nonsense. “And then, her husband—you know, after all, she, again, was a full-throated support. She was very close to Robert Rubin, to Lawrence Summers, to the people in the Clinton administration who gave us the radical deregulation of Wall Street, which, you know, caused incredible misery and the Great Recession—the Clinton signing on the collateralized debt obligation law which allowed all that junk to be legal, the Commodity Futures Modernization Act, the Financial Services Modernization Act, the reverse Glass-Steagall. So they’re the ones that opened the door to the Wall Street thieves that brought on the Great Recession. And then, as senator, she’s carried water for Wall Street faithfully. Read, see, and listen to more at DEMOCRACY NOW! TRUTHDIG—To someone who has watched many “scandals” surrounding Hillary Rodham Clinton evaporate into the Washington mist—even when Pulitzer Prize-winning pundits predicted that she would end up in prison!—the current furor over her emails hardly seems earthshaking. It isn’t unreasonable to require public officials to conduct all public business on government email accounts, but there was no such ironclad rule when Clinton became secretary of state. In hindsight, it might have been better for her and the public if she had done so. Yet many prominent people, both in and out of government, have preferred private email, in the belief that those accounts provide stronger encryption and safeguards against hacking. So far, the former secretary of state doesn’t appear to have breached security or violated any federal record-keeping statutes, although those laws were tightened both before and after she left office. She didn’t use her personal email for classified materials, according to the State Department. Certainly Clinton wasn’t the first federal official or Cabinet officer to use a personal email account for both personal and official business, as most news outlets have acknowledged by now—indeed, every secretary of state who sent emails had used a personal account until John Kerry succeeded Clinton in 2013. Collective Bargaining Under Duress: Case Studies of Major North American Industries (2013), edited by Howard R. Stanger, Paul F. Clark, and Ann C. Frost. “Driven From New Orleans: How Non-Profits Betray Public Housing and Promote Privatisation (2012) by John Arena, College of Staten Island (CUNY)” by Lumpenproletariat.org. “My Turn: Hillary Clinton Targets the White House (2015) by Doug Henwood” by Messina, 29 FEB 2016, Lumpenproletariat.org. “Historical Archives: Third-Party Challenge to Unconstitutional Prop 14” by Messina, 2 MAR 2016, Lumpenproletariat.org. “Hillary Clinton, US/NATO Imperialism, & the Lynching of Gaddafi“, 3 MAR 2016, Lumpenproletariat.org. We make the assumption that we share progressive, evolutionary, dynamic, and adaptive political principles, rather than static, past-binding, or socially conservative political principles. This assumption means we understand the fact that the Republican Party is unabashedly anti-working class. The only questions of some lingering debate, which remain for democratic people of conscience, is to question whether or not the Democrat Party is worthy of working class support; whether or not the Democrat Party is anti-democratic in its collusion with the Republican Party to exclude alternative parties from the presidential debates; whether Top Two Primary legislation infecting states across the nation, supported by the Democrat and Republican parties, is anti-democratic. These are the kinds of questions we, working class and underclass, people must address before deciding to support corporate-funded Hillary Clinton, the corporate-funded Democrat Party, or the corporate funded two-party cartel, or two-party dictatorship because we know that settling for the lesser of two evils or voting for the least worst means that our elected officials become less responsive to the needs of the people over time. In the USA, we allow political extremes on the right, often corporate funded, but marginalise or censor political extremes on the left. In such a political climate, it’s inevitable that the political center continually shifts rightward, such that Obama’s Democrat administration is widely considered to be politically to the right of Ronald Reagan or the Bush Dynasty.